Chapter 2b of Part 2 Code of Practice sets out the requirement for local health boards and the local authorities in the area to form partnership arrangements to undertake a population needs assessment. Where a combined population assessment report has been produced, local authorities and health boards should produce a joint area plan. 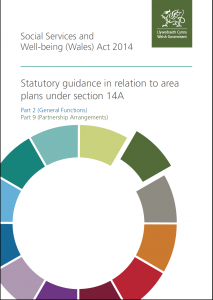 These joint area plans must provide a description of the range and level of services proposed to be provided or arranged in response to the care and support needs, including the support needs of carers, identified in the combined population assessment reports. The first area plans must be published by 1st April 2018.